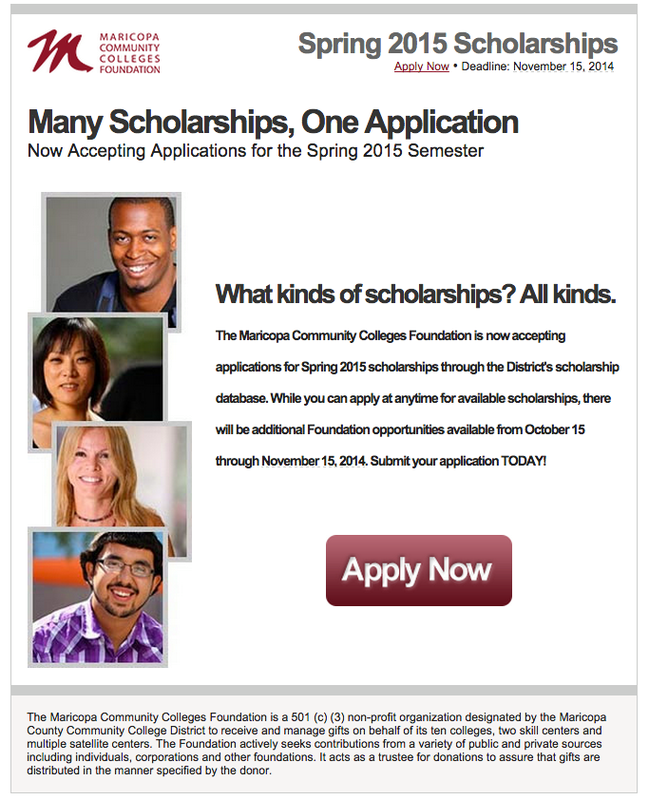 Application deadline for mcccdf.org spring 2015 scholarships is November 15. There are ten scholarship opportunities specifically for Rio Salado College students and employees, including the We Are Rio Employee Scholarship fund and the new Arizona Public Service Foundation I2teach Scholarship Fund, which is helping adults who have a bachelor’s degree transition into teaching careers, especially those interested in teaching STEM (Science, Technology, Engineering, or Mathematics) related classes. The web site for the application is maricopa.academicworks.com. Type “Rio Salado” into the search engine to find opportunities unique to the college. Minimum G.P.A of 3.0, Arizona resident status. Scholarship ranges from $250-500 per semester. Deadline: January 12, 2015. Minimum 2.0 GPA and demonstrate financial need. Award amount varies. Deadline: January 2, 2015. Fill out the application, it will be well worth your time. Visit this Maricopa Colleges web page: http://ow.ly/DMrPW to watch a video tutorial about successful tips and strategies to consider in all of your scholarship applications. Rio Salado students who need additional help can reach out to our counselors at http://www.riosalado.edu/counseling/Pages/default.aspx.